Cornwall and Stormont, Dundas & Glengarry boast an amazing array of golf courses that will provide a fun challenge for golfers of any ability. Find a list of golf course below. You can always find a tee-time at Summerheights Golf Links in Cornwall, the largest golf course in the region. Summerheights offers two dynamic 18-hole layouts with a full-service clubhouse and dining room. Situated along the banks of the St. Lawrence River, the Cornwall Golf and Country Club is one of Canada’s oldest golf clubs. Recognized as a premier golf course in Eastern Ontario, the course features lush fairways, challenging water hazards and strategically positioned bunkers as well as small, speedy and tricky greens. Two outdoor patios offer spectacular views of the course and the river. The Upper Canada Golf Course in Morrisburg was designed by noted architect Robbie Robinson and its 18 holes offers glimpses of natural beauty and wildlife like no other course. 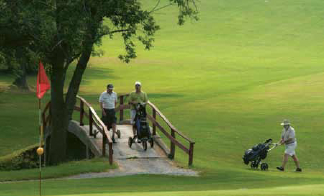 The Glengarry Golf and Country Club is nestled among rolling hills in Alexandria. The Garry and Delisle Rivers wind their way through the property, coming into play on many holes. Cloverdale Links Golf Course near Winchester offers a true links style challenge with wide rolling fairways and large greens. The unpredictable winds are a factor that you quickly learn to respect when selecting the proper club. Work up an apetitite with this 27 hole course at Heritage Golf Club in Lancaster, and eat at their restaurant located on the grounds. Click here to visit them on Facebook. Cedar Glen is a semi-private golf facility offering a challenging 9 hole, Double Tee Arrangement for 18 Hole play, countryside course. For those who prefer the flat blade, there are several mini-putt facilities throughout the region that can provide hours of fun for the entire family. 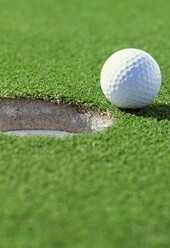 Below you will find a list of mini putt locations in the Cornwall Area. Fine tune your swing at a number of driving ranges throughout the region, including the unique driving range at Archie’s Family Golf Centre in Cornwall, where your target is a small island in the middle of a lake. Enjoy time with family and friends by competing in a game of mini golf. Challenge your friends and family to a fun game of mini putt at Straight Shooter Mini Golf located on Highway 138 near St. Andrews.